On 24 March, a coup d’état took place in the Central African Republic (CAR). Seleka (1), a coalition of rebel groups, seized the country’s capital Bangui and President François Bozizé fled to neighbouring Cameroon. Seleka’s leader, Michel Djotodia, then declared himself the new head of state. The history of the Central African Republic is rich with uprisings. From 1960 onwards, the country’s government has almost never been replaced peacefully: in 1965, the country’s first president, David Dacko, was overthrown by Colonel Jean-Bédel Bokassa (subsequently Emperor Bokassa I), in 1979 Bokassa was overthrown by Dacko (although with the help of the French) and in 1981, Dacko was overthrown again, but this time by General André Kolingba. In 2003, a coup d’état was carried out by General François Bozizé. Just last year, two conspiracies to overthrow Bozizé were uncovered. (2) And lo and behold, in 2013 François Bozizé has been overthrown. Following the coup, the country’s army chiefs pledged allegiance to the new government. This will fundamentally destroy the entire structure. The Central African Republic contains troops from a whole number of countries (Chad, Cameroon, Congo, Gabon and the RSA) which should assist the authorities in restoring legitimate authority. However, since the army has switched over to side with the coupists, the situation has changed. A couple of other «helpers» in overthrowing the government should also be mentioned – France (who sent in nearly 600 servicemen) and the USA (who sent in more than one hundred military advisers). The coup on 24 March was not unexpected. What was unexpected, however, was the reaction of the international community. The most hard-line response came from the African Union, who suspended the participation of the Central African Republic in all the organisation’s activities. On the day the capital was seized and Bozizé fled the country, UN Secretary General Ban Ki-Moon issued a statement in which he condemned the coup, but he made no mention of restoring power to the legitimate president. (3) An urgent UN Security Council meeting was held on 26 March, but it failed to come to a decision. As a result of this meeting, Russian representative Vitaly Churkin, as Chairman of the Security Council, issued a statement condemning the attack and seizure of power in CAR and called for all parties to refrain from any acts of violence against civilians, including international personnel, as well as ensure safe humanitarian access to those needing help. Members of the Security Council called for all parties in the Central African Republic to restore the rule of law and constitutional order in the country. And once again, absolutely nothing was mentioned regarding the reinstatement of President Bozizé. It is impossible not to notice that the joint declaration of the BRICS countries following the Durban summit on 27 March contained no condemnation of the coup. There was everything else: «concern that the situation will deteriorate», «absolute condemnation of the use of force against civilians» and «calls for negotiation». (4) But there was nothing condemning the coup! Nor was there anything demanding «the immediate restoration of legitimate authority», which is traditionally heard in these kinds of situations. What is more, this is despite the fact that during the seizure of Bangui, citizens from two BRICS countries were killed – RSA and India! During Seleka’s attack on the country’s capital, the head of the UN Mission in CAR spoke of the errors made by the national security forces. (5) Following the army’s move over to the side of the coupists, one could ask whether these were errors or deliberate acts. At the very least, the reaction of the «international community» still gives grounds to conclude that, in reality, it does not want Bozizé to return to power and if it is demanding that order be restored in the country, then it is already without him. Especially since the rebels have managed to find a rather interesting formula for the transition period – Prime Minister Nicolas Tiangaye has remained in power. The authority of overthrown President Bozizé did not extend to a substantial part of the country. 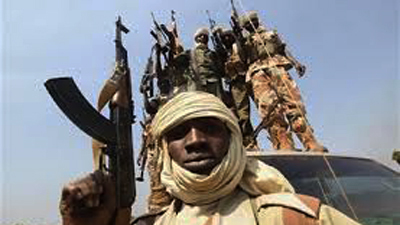 All military operations against the rebels were carried out with the support of foreign troops, primarily from France and the Republic of Chad. In fact, even the president himself was being guarded by soldiers from Chad who had been in the country since 2003 (the year Bozizé came to power). It is interesting that the overthrow of President François Bozizé took place almost immediately after Chadian soldiers began returning home in January 2013. The Central African Republic directly borders several «problem» regions in Africa. Firstly, the north of the country is under the control of Chadian rebel groups, secondly, the east borders the Sudan province of Darfur and, finally, to the south of the country is the Democratic Republic of Congo and its rebels. To the southeast of the Central African Republic, the notorious Ugandan «Lord’s Liberation Army» is in operation (whose leaders are being hunted by both the Ugandan government and the International Criminal Court). All of this compounds the situation considerably. There is one more significant aspect of the situation in CAR. The fact is that since 2005, the situation in the Central African Republic is being investigated by the International Criminal Court in The Hague. The person being tried is not involved in the current situation in CAR, however, but is the former vice-president of the Democratic Republic of Congo, Jean-Pierre Bemba, who is being tried for providing military help to the former president of the Central African Republic, Félix Patassé (who was later overthrown by the very same Bozizé). So a precedent for the international prosecution of a country’s president who has provided military assistance to a neighbouring country has already been established. The plan of prosecution is as follows: to establish that the troops sent in committed crimes while they were in the country, and charge the commander-in-chief of the armed forces in accordance with command responsibility. (8) Therefore, the heads of countries that sent in troops to help Bozizé should have a serious think about how to avoid becoming part of the «situation in CAR» in the International Criminal Court. The world’s media has already started a campaign against South African President Jacob Zuma, who sent troops into the Central African Republic at the request of Bozizé. Reports have emerged that South African soldiers in CAR killed several teenagers. (9) It seems that South African troops will soon be charged with committing war crimes. It is not impossible that the coup d’état in the Central African Republic will turn out to be a preparatory operation by special forces for quite a different coup d’état – in South Africa. It is possible that the plan is for South African President Jacob Zuma to be removed and for the International Criminal Court to issue an order for Zuma’s arrest. (10) You will recall that the coup d’état in CAR took place three days before the start of the BRICS Summit in South Africa. As is well-known, joining BRIC was the initiative of South Africa. Similar initiatives, from the point of view of the forces of the «new world order», cannot go unpunished. (1) In the Songo language – one of the main national languages spoken in the Central African Republic – «seleka» means «alliance». Seleka is made up of main groups including the Union of Democratic Forces for Unity (UFDR), the Convention of Patriots for Justice and Peace (CPJP) and the Wa Kodro Salute Patriotic Convention (CPSK). (2) See the Report of the UN Secretary General on the Situation in the Central African Republic // UN Document S/2012/956 dated 21 December 2012, paragraph 5. (3) See the UN Secretary General press release – Condemning seizure of power in Central African Republic, Secretary-General // UN Document: SG/SM/14905 AFR/2585. (4) Paragraph 31 of the eThekwini Declaration, 27 March 2013. (5) See the UN Security Council session report dated 11 January 2013 for the 6899th meeting of the Council // UN Document: S/PV.6899, Page 6. (6) See: Entsiklopediya Afrika, Chief Editor A.M. Vasilyev, Institute of Africa of the Russian Academy of Sciences, Moscow, Entsiklopediya, 2010, Vol.2, p894. (8) This is also the plan favoured by the International Tribunal for the Former Yugoslavia. Charges of command responsibility are being brought against virtually all of those accused in the tribunal, including Slobodan Milošević, General Mladić, Radovan Karadžić, Milan Martić and Goran Hadžić – all as the commander-in-chiefs of the armed forces of Serbia, the Republic of Srpska and the Republic of Serbian Krajina respectively. (10) A UN Security Council resolution is not even needed for this – South Africa is a member of the ICC Statute and a court prosecutor can, on his own initiative, begin an investigation and institute proceedings against the president of South Africa.